During my undergad at FSU, I was an active member of the sorority Alpha Delta Pi. 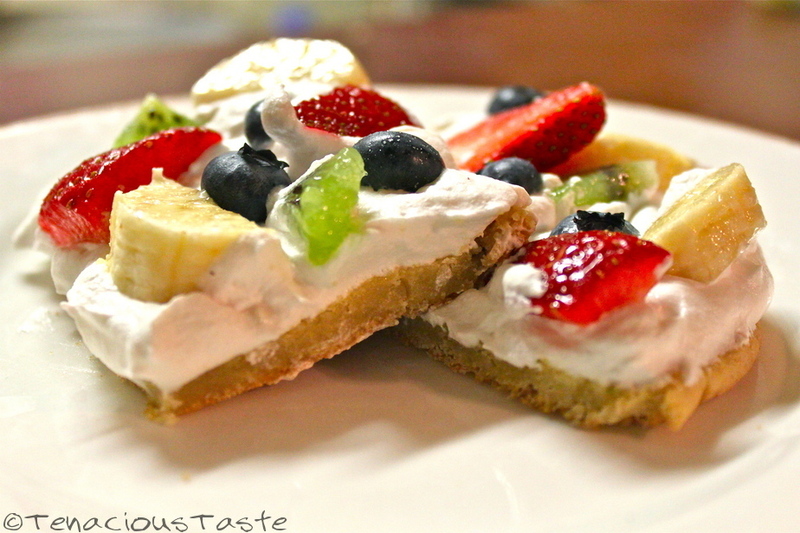 One of the most coveted desserts we looked forward to at meal times was the famous fruit pizza. It was so popular that other houses on campus started making this amazing dessert as well. Our dear staff member Miss Joyce always made this recipe with cream cheese icing, which although divine, packs a lot of extra calories. I found an amazing organic cool whip spread that works just as great and saves some of the guilt as well! Every time I make this dessert it is gone in seconds and it will always remind me of my days as a sorority girl at FSU! Spread a generous amount of whipped cream on top of cookie, about half the tub. I am totally in love with Immaculate Baking Co.! They have a slew of all-natural and organic refrigerated baking goods like cookies, croissants, and biscuits that are really delicious. They can be found in most organic/natural markets and Publix carries them now too! I also found an amazing natural low-cal "cool whip-like" whipped cream that is simply to die for. It's called TruWhip and its only 30 calories for 2 tablespoons! This dessert/snack is extra yummy when the dough is just a tad under-cooked. Pay attention to the directions on the cookie dough label in congruence with how much you've thinned out the dough. This is also a great dessert recipe for the Independence Day, as you can easily make a great American flag out of blueberries, raspberries, and strawberries! Thanks for sharing this! It was always a favorite when going to events at ADPi!